Jo Dorsch, M.A.L.S., A.H.I.P., Professor and Regional Head Librarian at UIC Illinois Library of the Health Sciences-Peoria. 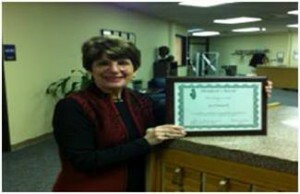 In recognition of significant service to HSLI, the recipient of the 2011 HSLI President’s Award was Jo Dorsch, M.A.L.S., A.H.I.P. at UIC of Illinois Library of the Health Sciences-Peoria. Jo led and managed a team of experts in the online continuing education of evidence based practice (EBP)research. HSLI members participating in the pilot study received 21 MLA CE credits. 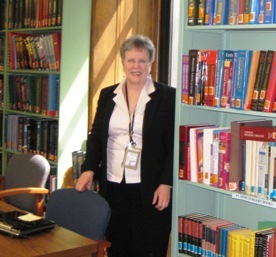 Jo’s work furthers librarians’ knowledge and understanding of EBP research. Thank you and congratulations to Jo! Syed Maghrabi Scholarship 2011: Conference Report from Carol Jeuell, M.S.L.S., A.H.I.P. Carol Jeuell, M.S.L.S., A.H.I.P. is the Reference Librarian at Brennemann Library of Children’s Memorial Hospital, Chicago, Illinois, and one of the three winners of the Syed Maghrabi Scholarship for 2011. I’m grateful for the scholarship that I received to attend the annual HSLI meeting at Starved Rock Lodge. With my hospital department facing reduced budgets, I was very appreciative of having this scholarship to support my attendance. I’m also happy that this scholarship continues to honor and remember Syed Maghrabi. He was a wonderful person who was a pleasure to know and who appreciated the opportunities for learning and networking that are the highlight of HSLI meetings. This statewide conference always manages to be a bargain in terms of fees for registration, continuing education classes and the quality of the meeting content. The location at Starved Rock was perfect for a fall meeting. The facilities, keynote speaker and continuing education courses that were offered were much appreciated and will be helpful in my job. Keynote Speaker: The keynote address by Michelynn McKnight and her continuing education class “The Agile Librarian’s Guide to Thriving in Any Institution” were timely and inspiring. Michelynn reminded us of the many opportunities that we have on a daily basis to promote our services to support the work of our institutions. The many real life examples that she offered were helpful and gave us some action items that we can easily implement in our jobs. Her book is a resource to consult for both promoting our services and thriving in our institutions. Continuing Education Class – “Information Anywhere: Mobile Technology, Libraries and Health”. I took Max Anderson’s class, which was very informative for information on mobile technologies. Max listed the range of mobile devices that are currently available and reviewed applications that are relevant to medicine. We practiced creating our own mobile website with Google Sites and we learned how to generate a QR code. Detailed hand-outs that were included with the class will be useful for future reference. Our annual meeting is a great opportunity to keep up with the latest developments in print and online resources, software, equipment, web applications and library management. The chance to network is always appreciated and helpful in many ways. I thank the scholarship committee for the support to attend this meeting. Whether or not you were at the keynote address by Michelynn McKnight, PhD, AHIP at the HSLI 2011 Conference, you may be interested in the outline of her presentation, ” Reach, Balance, Achieve: Doing Better What We Have Always Done Well”. The outline, with citations, is at the conference section of the HSLI Web site. Click here to link directly to the outline. Syed Maghrabi Scholarship 2011: Conference Report from Eric A. Edwards, M.S.L.I.S. Eric A. Edwards, M.L.I.S. is the Public Services Librarian at the Charles E. Becker Library of Benedictine University in Springfield, Illinois, and one of the three winners of the Syed Maghrabi Scholarship for 2011. I would like to thank Jerry DeWitt and the scholarship committee for their support. This was my first time attending a Health Science Librarians of Illinois annual conference. I do not work in a hospital setting (I am a public services librarian at a liberal arts university), but I still benefitted greatly from the conference sessions. The presentations applied to the entire library and information science profession, and not just to medical librarianship. One of the sessions that I found particularly useful was “The Agile Librarian’s Guide to Thriving in Any Institution. The focus of this presentation was the necessity for every librarian in the profession to understand the goals and responsibilities of both immediate and more distant colleagues in one’s institution, in order to interact better with those colleagues. This is especially relevant to my work in that Benedictine University at Springfield is a branch campus of Benedictine University in Lisle, and I have constant interaction with my colleagues there, including the library staff. Another session that was especially helpful was “Information Anywhere: Mobile Technology, Libraries & Health”. Although the emphasis of this session was on primarily applications concerning medicine, the use of mobile technology generally is something with which I have been heavily involved, as the Benedictine University libraries recently acquired iPads for librarian use. Once again, I would like to thank Mr. DeWitt and the scholarship committee. I found the HSLI 2011 Conference very worthwhile, and I look forward to participating in future HSLI events. The HSLI Conference Planning Committee is looking for your comments and suggestions. Everyone who attended the HSLI 2011 conference, please complete the conference evaluation before November 12th, if you didn’t complete one at the conference. Don’t forget the deadline is November 12th. You can still register to attend the HSLI 2011 Conference! All information is on the conference web site http://hsli.org/conference/. We are offering 3 MLA CE courses (you may attend 2), a nationally recognized keynote speake, Michelynn McKnight, a fun-filled Nancy’s Reception, one-on-one time with exhibitors http://hsli.org/conference/exhibitors.shtml, and a spectacular conference location. It’s still road construction season, so do visit the Starved Rock & IDOT web sites for the latest news on construction and recommended alternate routes. HSLI 2011 Conference – Shhhh! A Silent Auction! A silent auction to benefit the Syed Maghrabi Conference Scholarship fund will be held on October� 13 from 6:30 pm to 8:30 pm during Nancy�s Reception at the HSLI 2011 Conference. To donate any items for auction,� please contact� Jerry De Witt,� Syed Maghrabi Scholarship Committee Chair or Fran Kovach, Silent Auction Coordinator. Winners do not need to be present when the winning drawings are made and announced at the end of the auction. Some of the prizes include:� gift cards from restaurants,� Scheels,� Starbucks, Matthews Medical Bookstore,� Applebarn candles,� and a bed & breakfast package for a stay at Starved Rock;� a 2012 poster calendar from the Library Resources Group; and a book, The Agile Librarian, authored by the conference keynote speaker,� Michelynn McKnight. Please come to the� auction display and support this worthy cause.�� Payment by check will be accepted. The Star Fish Thrower Award is presented to a HSLI member who made a difference to the organization. The winner receives a trophy and is honored at the awards ceremony held during the HSLI 2011 Annual Conference in October. The HSLI Business Meeting will conclude the 2011 conference�and will be held Friday, October 14 from 12:00 – 1:30 pm.� Please submit any agenda items to Fran Kovach fkovach@siumed.edu�� Looking forward to seeing everyone at Starved Rock! You are currently browsing the archives for the 2011 Conference category.